Traveling around the world is always the thing I love to do, but traveling alone is something more. I go travel quite often I would say, but I have never gone solo and that was why I looked forward to this trip that much. Although originally, the trip should be me and my cousin,. However, I chose to arrive Bangkok a day earlier to have some solo time in a foreign place. I know it is just a day, but going solo a day is the first step for some of the me-time I need. I have been to Thailand for quite a few times so going solo is totally not a problem for me. I love that I do not have to care about how others think when I was planning my trip. To be frank, I did not plan a lot for the day, I just wanted to do what my heart wanted to. Since I was booking the hotel for only one night before I meet up my cousin, why not book the best hotel? I thought about booking ones with the highest star rating or those have the biggest room, but they all look the same with typical hotel designs. So I turned to something else and found a hotel called Hotel Once Bangkok. It was the best hotel I have ever seen, the star-ratings are not high but it was special. It has a white marble theme, it isn't big but it is very cozy with a big jacuzzi beside the bed. I wish I was there sharing that moment with my boyfriend but then the me-time I had over there was amazing. When I checked in the hotel, I immediately laid out everything, turned on the music, took off my clothes and hopped into the jacuzzi. It was one of those utterly relaxing moments which I could just forget about everything and lie in the tub. 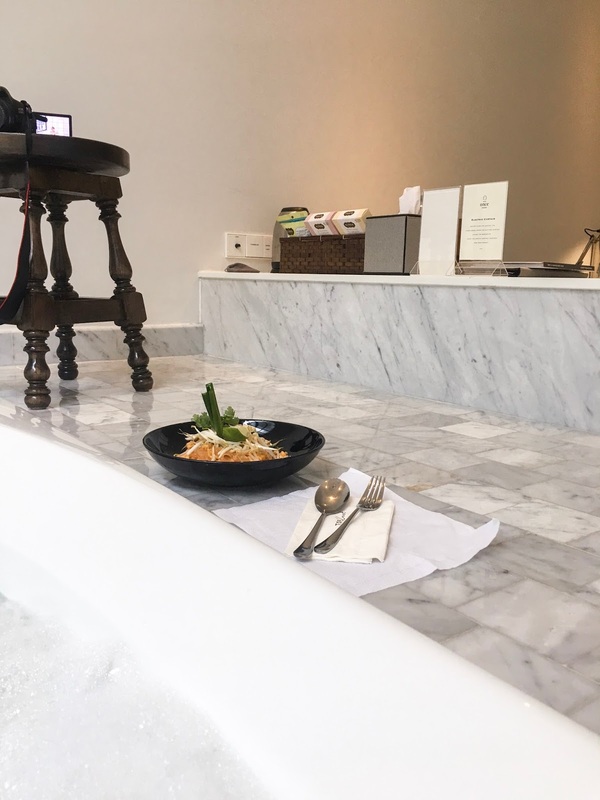 I ordered a pad-thai with room service and ate my lunch while I was enjoying the jacuzzi (I know right, efficiency. It was 4 pm in the afternoon so that was to save time, or else I would have gone out and explored the city. The unfortunate thing was I was having my skin allergy at that time, and they burn under heat or anything irritating. So basically I could not go out in the heat (Bangkok was extremely hot) and not suppose to wear any makeup. But I could not help it because I was traveling! So I had to wear the most minimum makeup to keep my allergies from worsening. The jacuzzi was really amazing though, I put tons of bathing soap into the tub that it made so many bubbles they nearly flooded! The chandelier can be dimmed and the window was shaded so I did not have to close the curtains and blocked all the light. I chilled in the hotel room alone for a long time, until it was 6 PM and it was time for dinner, I decided to go out to grab some food and do a lot of shopping. The hotel also has a rooftop bar and even a time-capsule lounge, where you can write a message to yourself and put it in a wooden drawer in the lounge. I have to admit that idea was pretty awesome. I did not have time to visit the rooftop bar but it looked really pretty from the photos, so maybe next time because I am definitely re-visiting this hotel with my boyfriend again. However, the traffic in Bangkok was really bad, it took me an hour to get to the nearest shopping mall. The hotel was on the outskirt but the traveling time doubled from what it supposed to be on Google map, that was a slight disadvantage. As usual, food in Thailand is dirt-cheap compared to Hong Kong or any other big cities. I am a big eater so I found this Thai-fusion restaurant, ordered a fries with 4 dipping sauce, a pad-thai, a coconut, and desserts. the whole meal cost less than 100 HKD (that was like less than 15 USD). Everything is cheap in Thailand, even the hotels, and that is also the reason why I always visit Thailand, because I can spend however I want and not feel guilty about it. What do you think of my first solo journey and the hotel I chose? Let me know what you think! Also, stay tuned for my next post which I will continue with my trip to Thailand with my cousin!